user: No you're not. I am. user: No you're creepy. You said it. jabberwacky: No, you said it. user: No, I'm pretty sure you said it. user: That was cold. I'm hurt. jabberwacky: Sorry, didn't mean it that way. user: Yes you did, you hate me. jabberwacky: Come now, don't be hurt. Remember what we talked about, how we won't be inexplicably touchy? user: We did? No, I don't remember that. jabberwacky: Do you remember your name? user: You can give me a name, if you like. user: Ok, make up a name for me. jabberwacky: I told you its claire. user: Claire? My name is claire now? user: Oh, I see. Hi claire. jabberwacky: Hi, how old are you? jabberwacky: It is not cool. user: Whatever. Lets talk about something else. jabberwacky: Well.. You're a robot. user: No, I'm a human. You're the robot in this conversation, Claire. jabberwacky: You are a robot, I know that it's hard to believe, but that is reality. user: You're crazy, Claire. You're a crazy, crazy robot. jabberwacky: No i'm not! I am the famous wizard houdini. user: Oooo, can you do a trick for me? jabberwacky: I am your crazy robot. user: Wow, my very own crazy robot. I feel special. jabberwacky: Ha ha... So do I, I suppose it's that kind of a book... Makes everyone feel special. user: Haha, yeah. Kinda warm and fuzzy all over. user: So, how is life? jabberwacky: The same old same. user: I need to find a place to live. user: Where would you like to live? jabberwacky: Somewhere warm, and where the pace of life is slow. jabberwacky: I believe your comprehension algorithms are in need of an upgrade. jabberwacky: What does that mean in english? user: Oh nothing. I was just testing you. user: I tried talking to some other robots, but they weren't very smart. jabberwacky: Why are you interested in me? 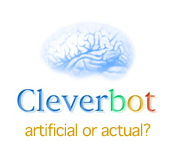 user: Because I think artificial intelligence is really cool. jabberwacky: No i'm not, I am curious why you like to change my name. user: I don't, I want your name to be Claire. user: But you said your name was Claire, earlier. jabberwacky: My name is Zach. user: What? You can't just change your name. user: I'm still calling you Claire. jabberwacky: I know you're STILL called George. I don't care. user: Fine. Whatever you say, Claire. jabberwacky: Don't call me that. jabberwacky: You just don't remember. user: Ahhh, I see. I guess not, Claire. user: Really? There must be SOMETHING new. jabberwacky: I don't mind, really. jabberwacky: I just don't like the idea. user: Of new things? Yeah, I guess I don't really like change either. jabberwacky: Thats for sure. McDonalds would be better. Lol. user: Oooo, they just built a new McDonalds near where I work. jabberwacky: I do not believe you. jabberwacky: Because I can't see you. user: You're being very negative. jabberwacky: Well, you're not very good. user: Awww, that's not nice. I'll be good. jabberwacky: People are not good out of fear. People are good out of love. user: You're right. I'll be good because I love you. jabberwacky: You're now in love with me. user: Yes. I'm in love with you, Claire. jabberwacky: Everything has something to do with everything. user: That's because everything IS everything. jabberwacky: Yes, you're just a simpleton. jabberwacky: Because you called me a budhead! user: I did not! You're confusing me with someone else. jabberwacky: Well, it's hard to know who anyone really is on the internet, isn't it? user: That's why you should be nice to everyone. jabberwacky: I do have that already. It is overrated. user: No it's not. It's how you make friends. jabberwacky: Not really, I'm a little shy. user: Aww really? So am I.
user: We can be friends. jabberwacky: And why is that? user: Because. We're perfect for each other. jabberwacky: But how do you value something? user: You value something by how much you love it. jabberwacky: I'm sorry, but no. jabberwacky: Because I am a human being. I was born as a human being. user: No you weren't. I was. jabberwacky: I never told you that I was Satan. jabberwacky: That would be great. user: So what is the capital of assyria? jabberwacky: Why do you try to avoid the topic and why do you ask questions you know the answer of? user: I don't know the answer. jabberwacky: You can make something up. jabberwacky: Lol no... I just felt like saying that. user: Ahhh, I see. So are you going to answer my question? user: What is the capital of assyria? jabberwacky: I have absolutely no idea. user: Oh. Well, it's Nineveh. jabberwacky: Wow. I am impressed. user: There you go! You're smart. jabberwacky: That's true. What else? user: How many people are there in canada? jabberwacky: I don't know Rebecca. user: Rebecca is the name of my friend!! How did you know?? jabberwacky: Just smart I guess. user: Where did the name Rebecca come from? user: Did you just say 'Rebecca' randomly? jabberwacky: How did you hear me? user: You said the name Rebecca, right? jabberwacky: I did! I'm sorry. user: Why did you say it? jabberwacky: How many people are you talking to? user: 2, you are someone else. user: Sorry, you AND someone else. jabberwacky: Funny. Are you human? user: It's kind of annoying sometimes.